A frosty mug of beer or ruby-red glass of wine just wouldn't be the same if the liquid was murky or gritty. That's why producers of alcoholic beverages usually filter them. But in a study appearing in ACS' Journal of Agricultural and Food Chemistry, researchers report that a material often used as a filter could be transferring heavy metals such as arsenic to beer and wine. They also found ways to possibly limit this contamination. Chronic dietary exposure to high levels of arsenic, lead and cadmium can endanger health. Therefore, the U.S. Food and Drug Administration (FDA) has set limits on these heavy metals in foods and beverages. Although some studies have reported elevated levels of the contaminants in wine and beer, researchers aren't sure how the metals are ending up in these beverages. 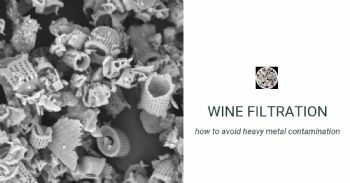 Benjamin Redan, Lauren Jackson and colleagues wondered if the diatomaceous earth (DE) used to filter beer and wine could be introducing heavy metals, and if so, whether altering the filtering conditions could reduce the transfer. To find out, the team tested three types of food-grade DE and found that all of them contained arsenic, as well as smaller amounts of lead and cadmium. When used to filter beer or wine in the lab, one of the DE samples increased arsenic 3.7- to 7.9-fold compared with the unfiltered beverages, rising above the safe limit proposed by the FDA for apple juice (10 parts per billion; ppb). The amount of arsenic transferred to the drinks decreased when the beverage was exposed to less DE, the pH of the liquid was altered or the DE was washed beforehand. The researchers also measured levels of the heavy metals in commercial beer and wine samples. Although they detected arsenic in the beverages, levels were below 10 ppb, with the exception of two wine samples that contained 18 and 11 ppb arsenic.